Freeze Breeze | EDG Sp. z o.o. Unique, fresh fragrance of washed clothes! to be poured into washing machine drum just before the washing. Freeze Breeze – beautiful fragrance of your clothes even for 14 weeks. Freeze Breeze fragrance beads is an ideal solution for those who want their clothes smell perfectly for a long time! Just pour the product inside washing machine drum before washing. 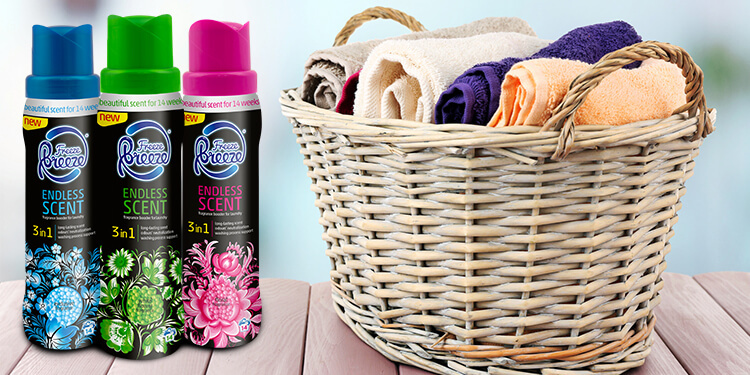 From the very beginning of the washing cycle, Freeze Breeze beads release their fragrance directly into fabric fibers. Freeze Breeze fragrance beads are a perfect neutralizer for unpleasant odors. They also support detergents in removing stains. Freeze Breeze fragrance beads gives a delicate, pleasant and unique aroma for your clothes. Product is available in 3 options: Exclusive Fragrance, Floral Fragrance and White Floral Fragrance. One package contains 275 grams of the product. What distinguishes Freeze Breeze products? Fragrance beads make a perfect complement to everyday detergents. They make clothes not only smell pleasantly, but also are supporting the process of removing the most stubborn stains. Intensive, sustained fragrance – even for 14 weeks. Freeze Breeze fragrance beads also support process of removing stains. Reasonable and competitive price comparing to most popular brands. The effectiveness of the products has been confirmed by a number of independent tests.